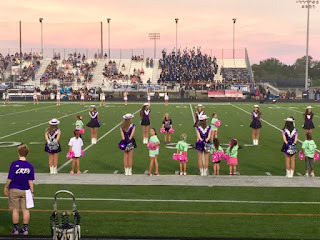 Almost exactly one year ago I wrote about experiencing Friday Night Lights for the first time. 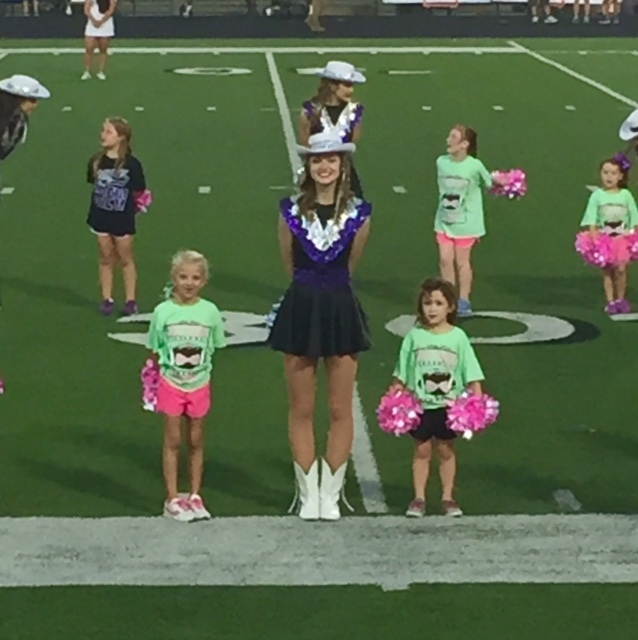 We had Hallie to thank for that eye-opening night at the stadium, and we have Hallie to thank for the opportunity to have done it all again this year. 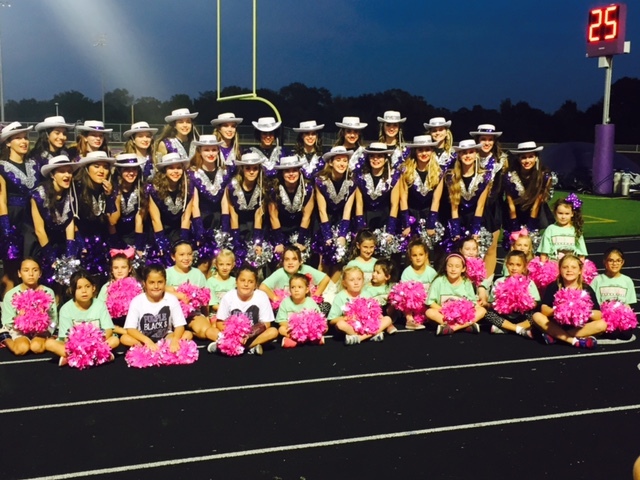 Every August the College Station High School Strutters - the school's dance team - hosts a dance camp for little girls. A perk of attending this camp is the invitation to participate in the opening "ceremonies", alongside the Strutters, at one home football game. 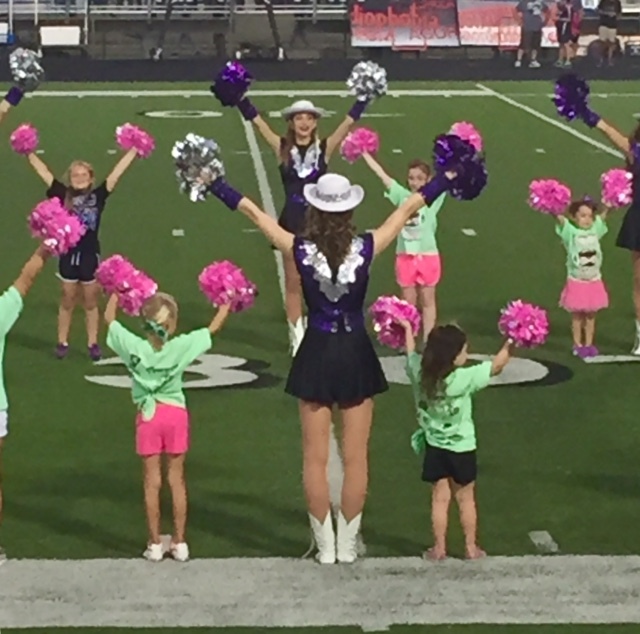 Today's High Fives are in honor of football season, specifically our family's second annual Friday Night Lights! 1. Hallie and I actually started our Friday night off with volleyball rather than football. We met friends at the high school to watch a few of the varsity team's bumps, sets, and spikes, but ended up catching only the last four points of the JV team's game, which happened to run late. 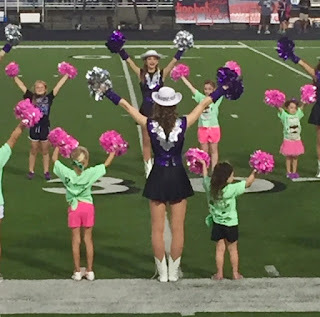 The talent on the JV team vastly exceeded our expectations though - we had no idea we were cheering for JV until their match concluded - so we've made plans to go see the school's (what we can only assume will be an) impressively talented varsity team play later in the season. 2. As we walked out of the volleyball gym I saw - about 15 yards in the distance - one of Hallie's two-year-old preschool teachers. Andrea spotted Hallie, glanced up at me, and then looked back down at Hallie with a huge smile on her face. She joyfully called out, "IS THAT MY HALLIE?!?!" and opened her arms, into which Hallie went willingly. After their embrace, we all chatted for a couple of minutes about how kids grow up and life passes too quickly. It wasn't until we went our separate ways that Hallie turned to me and asked, "Mama, who was that?" Andrea and Hallie, five years ago. It means the world to me that when we run into Will and Hallie's wonderful preschool teachers out and about in our community, they remember my kids...even if my kids have no recollection of spending years of their lives in these women's care. 3. Meanwhile, Tom and Will - who were supposed to be getting and saving seats inside the football stadium - were taking full advantage of the tailgates going on in the parking lot. 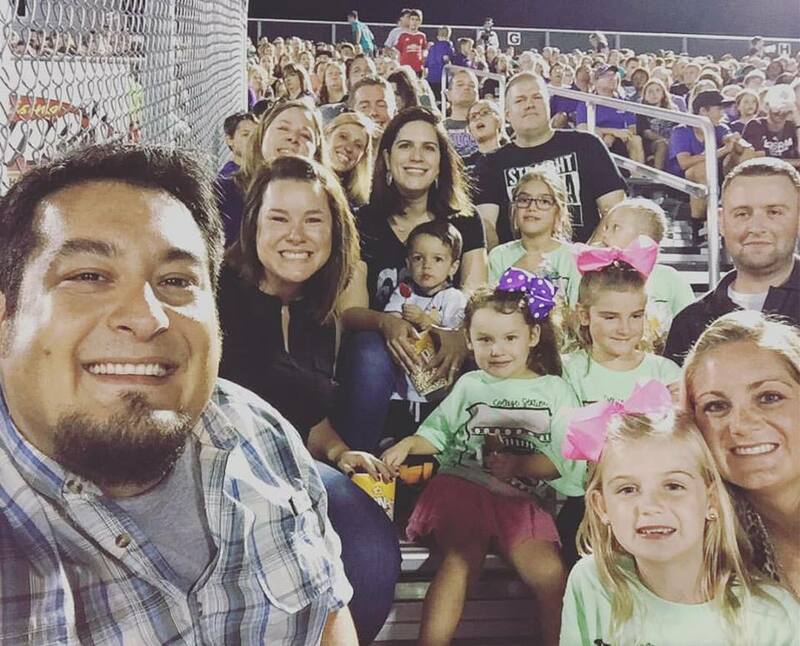 Yep, fans tailgate at high school football games in Texas. (Tailgating was new to me this year - neither Tom or I remembered any tailgating at last year's game.) At one point Tom called me to ask if he and Will needed to go into the stadium right then, or if they could hang out at the tailgate for a little while longer. I suggested he get himself inside ASAP - those seats weren't going to save themselves - to which he replied, "but E...r...i...n...there are free hotdogs here!" 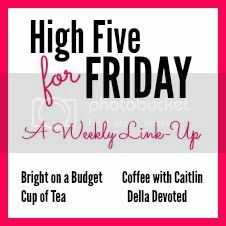 in a Hallie-like voice. My boys really like to tailgate. 4. 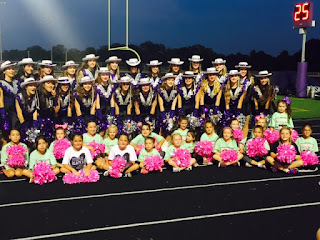 Our girls did a great job as unofficial members of the spirit squad during the pregame festivities, and the official members of the dance team, cheerleading squad, and marching band offered exceptional performances during the halftime show. 5. The temperature, humidity, and mosquitoes, while not "pleasant", weren't "unbearable". We'll take what we can get in the weather and insect categories. 6. Our kids - all nine of them in our group - were ridiculously well-behaved. Yes, they spilled a few things (but so did Tom) and bumped into their neighbors every now and again, but overall they behaved like completely different children than last year. One year older for the win! 7. And last but not least, we won the game. By A LOT. 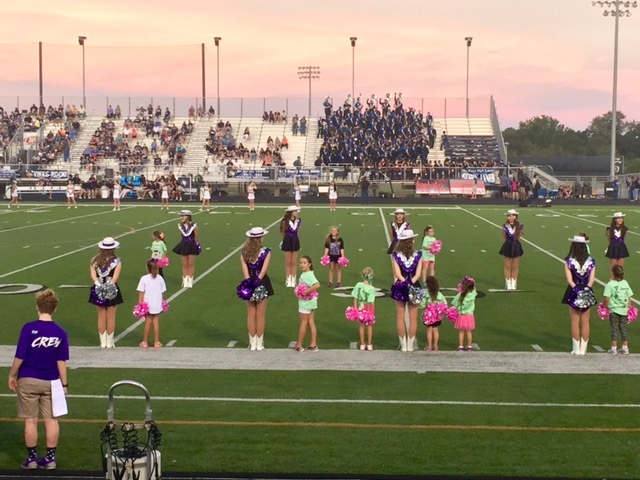 Another year, another Friday night spent under the lights.